Low lying Clogher contains wetland environments of considerable interest to naturalists. A plethora of small lakes include the appealingly named Lough Joe and Lough Frank. Archaeologists too, will find much to absorb them with the Cloc na hAltora dolmen, the ecclesiastical ruins and stone crosses of Drum and Doonamona Castle, a typical Irish tower house. The ancient art of the blacksmith much celebrated in myth and legend is evident in Clogher with the restoration of the old Forge. The bellows puff and the ringing tones of the anvil evoke memories of bygone days. 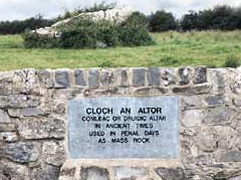 Cloch an Altór - used in penal times as a mass rock.